Rogue's Whiskey Ouroboros: Whiskey Stout and "Stouted Whiskey"
Let’s get one thing out of the way right away: Although the folks at Rogue Ales/Rogue Spirits make some fine whiskies these days—I’m partial to the Oregon Single Malt, myself—I haven’t always been a fan of everything the brewer-distillers put out. In particular, the brand’s flagship Dead Guy Whiskey, distilled from the same mash as Rogue’s classic Dead Guy Ale, has never really done it for me—too young, too grainy, and not quite my taste. So when I say that I “loved” the brand’s new Stouted Whiskey, this is all the more vociferous praise, given that Stouted Whiskey began its life as Dead Guy Whiskey. 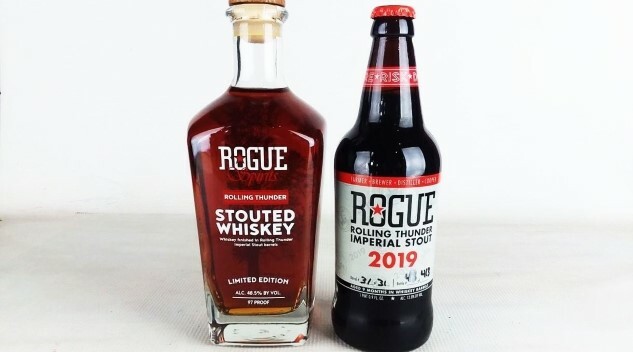 What I’m saying is this: Rogue has gotten so good at this that they’re now able to take a whiskey I don’t particularly like and turn it into one I love. I can’t think of many distilleries that can do that. First, I’m going to have to explain exactly what Rogue’s Stouted Whiskey entails, and to do that, bullet points are going to be very helpful. — First, the company distills a beer mash into what is essentially a batch of Dead Guy Whiskey. This whiskey ages in newly charred Oregon oak from Rogue’s own cooperage for one year. — Then, the whiskey is transferred out of those barrels, and the whiskey barrels are filled with Rogue’s Rolling Thunder Imperial Stout, which spends nine months in the barrel. In the meantime, the whiskey goes back into a freshly charred barrel. — Once the stout is done aging, it’s bottled, and the original whiskey goes back into the original barrel, where it spends another two years picking up residual stouty-ness, before being bottled at 48.5 percent ABV (97 proof). THAT is what Rogue is talking about, when they say “stouted whiskey,” and that’s why we used the word “ouroboros” in the headline—this whiskey is basically a Gordian knot of barrel-to-barrel transfers. How can you not be curious to taste something with that kind of pedigree? And so, we handled it the usual Paste way, with a double tasting. There’s something fittingly labyrinthine about aging a beer in the barrel that previously aged what was essentially a distilled beer, is there not? Regardless, this imperial stout, which weighs in at a burly 12.8 percent ABV, is frighteningly inviting in terms of profile. The nose is surprisingly subtle—not dominated by either booze or oak as one might expect, but instead layered with chocolate syrup, roast, caramelized sugar and red fruitiness. It doesn’t smell nearly as spirit-forward as most breweries are making their barrel-aged stouts these days, that’s for sure. On the palate, the booze certainly comes out to play, but this is still a drier and roastier barrel-aged stout than expected. There’s an assertively nutty quality to the malt character here that I rather enjoy—roasted chestnuts and ashy roast, duking it out with cherry cordial fruitiness. The nutty quality gives the coffee-esque roast a Columbian-type profile, leading into a long, roasty, slightly astringent finish that is fairly intense. Pastry stout, this is not. It’s a barrel-aged stout for roast lovers, though, of which I am one. I might be able to do with a touch more residual sweetness, but all in all, it still drinks frighteningly easy for 12.8 percent ABV. The real star of the show. This stuff is as unique as it is great: Warm and very malty, displaying characteristics of both bourbon and American single malts—a beautiful marriage between disparate styles. One immediately notices the color, which is very reddish, like the color of copper tubing in the glass. The effect of drawing some of that inky-black stout out of the oak, perhaps? I’m not exactly a taster who tolerates “desserty” most of the time, but this Stouted Whiskey is an exception worth making. It finishes with a long burn of spices notes that continue to build and evolve—cinnamon and cardamom call to mind Turkish coffee, while juicy cherry, raspberry and vanilla make you think of berry confections. This stuff is nothing short of a flavor bomb, and almost certainly the best whiskey I’ve had from Rogue. My hat’s off to everyone who waited the 3+ years it took to bring this beast to life. Stouted Whiskey isn’t cheap, with an MSRP that seems to be around $75, but it’s certainly an experience that I’ll remember fondly.